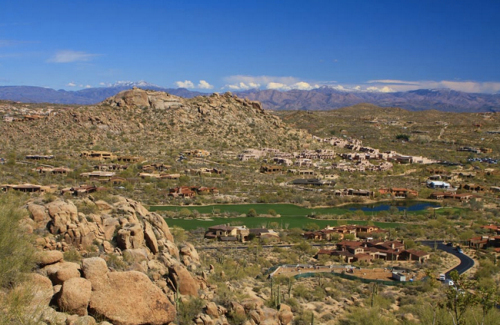 Troon boasts some of the best hiking in Scottsdale with beautiful views of the city, surrounding mountains and desert landscapes. One popular hike is Pinnacle Peak Park. It is located at 26802 N. 102nd Way, Scottsdale, on the east side of Pinnacle Peak Mountain. This hike is 1.75 miles one way. Please note that it is not a loop trail so to the end and back is 3.5 miles in total. Pinnacle Peak is a moderately difficult trail with rising elevation along the mountain. It has unique views over multiple golf courses. There is an elevation gain of about 1,300 feet. Although dogs or bikes are not allowed on the trail, rock climbing with appropriate gear is allowed in three designated spots on the trail. There are several amenities featured at Pinnacle Peak Park which include restrooms, water fountains, a ramada and several picnic tables. The parking lot is spacious with 90 parking spots. Another great hike is Brown’s Ranch Trailhead at McDowell Sonoran Preserve. 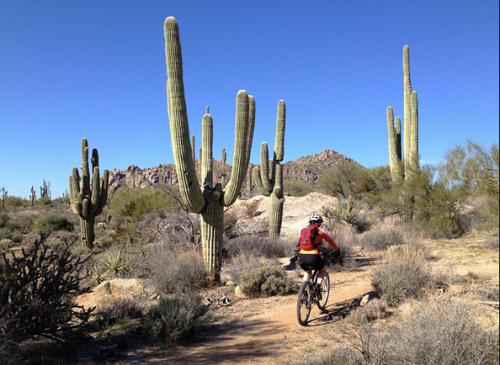 The trailhead is located at 30301 N Alma School Parkway, Scottsdale. This hike is also a there and back trail with a round trip distance of 3.1 miles. Brown’s Ranch is less strenuous than Pinnacle Peak. It is primarily flat with an elevation gain of only 100 feet. At the end of the trail, you will find the remains of Brown’s Ranch, which was in use from the late 1800’s to the 1950’s. In the springtime, there are lots of wildflowers. Bikes, dogs and horses are all welcome on the trail.